I like Craigslist. A lot. I like it because it allows me to buy things I could otherwise not afford. I like it because it’s reusing and it’s a win-win situation: I’m helping the seller get something out of his house he no longer wants or needs and for a small price, I receive something I need or want. 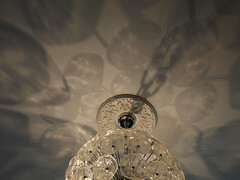 I like it because (thanks to a smartphone app) I can spend a minute or two a day quickly searching for one specific item (for example, “chandelier”) and, with patience, I’ll eventually stumble across the perfect one—no spending weekends at garage sales, no scouring furniture stores for sales. We paid less than $200. But the low price came with, well, a price. 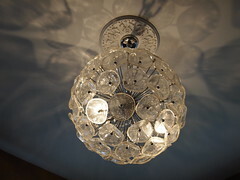 A high-end lighting retail store was selling it. It was hanging up in their showroom. 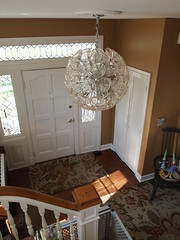 The ad on Craigslist mentioned that the buyer was responsible for taking the chandelier down and transporting it, and that the seller took no responsibility for broken glass. I forwarded Andy the ad. Again and again and again until he finally agreed to go look at it with me simply so I would stop forwarding him Craigslist ads at work. It was gorgeous. And big. “It’s too big,” Andy said. “I love it,” I said. We agreed to buy it. That was a Friday. The following Monday Andy’s alarm clock went off absurdly early. I shook him. The showroom opened at 6am. And closed at 5pm. Andy had to go before work to do this for me. He mumbled some words I couldn’t quite understand, gathered moving blankets, bins and tools, and left. About two hours later Andy texted me something about leaving … it wasn’t clear if he was talking about the showroom or me. 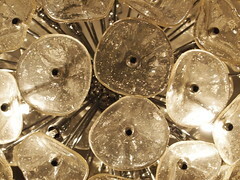 Turns out, to take down this chandelier, every single flower had to be unscrewed, wrapped and packed. And there are, I don’t know, close to 100 flowers. This, while standing on a very tall ladder. 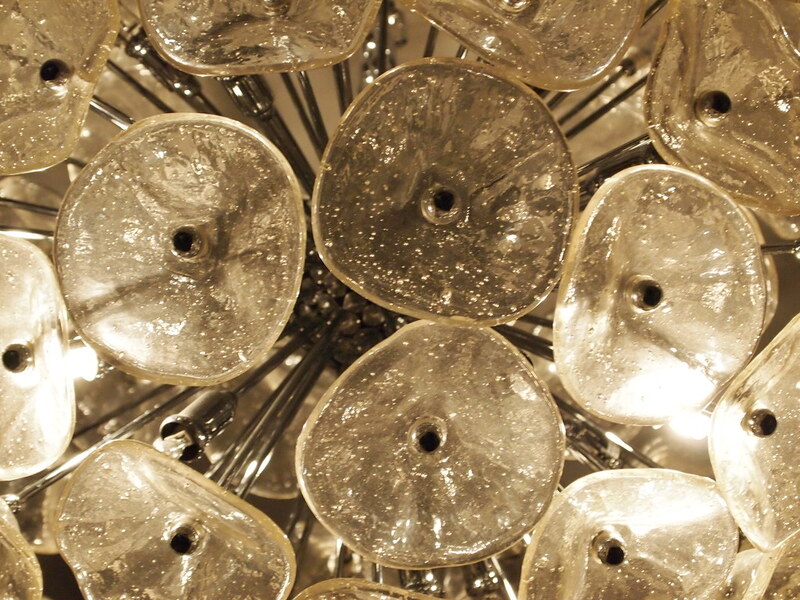 Once home, Andy asked me to pick up the plastic bin full of Murano glass flowers. I could barely lift it. “No way our ceiling will support that,” he said. I reminded him that this, this one thing, I just really, really loved. Reinforcing the ceiling required cutting a huge hole in the ceiling and doing I don’t know what to an electrical box that still had parts leftover from when our entry was lit by gas (we live in an old house). This, of course, also took a very.long.time. Which I tried very.hard not to complain about, seeing as I was the one who was requiring the ceiling to be reinforced in the first place. 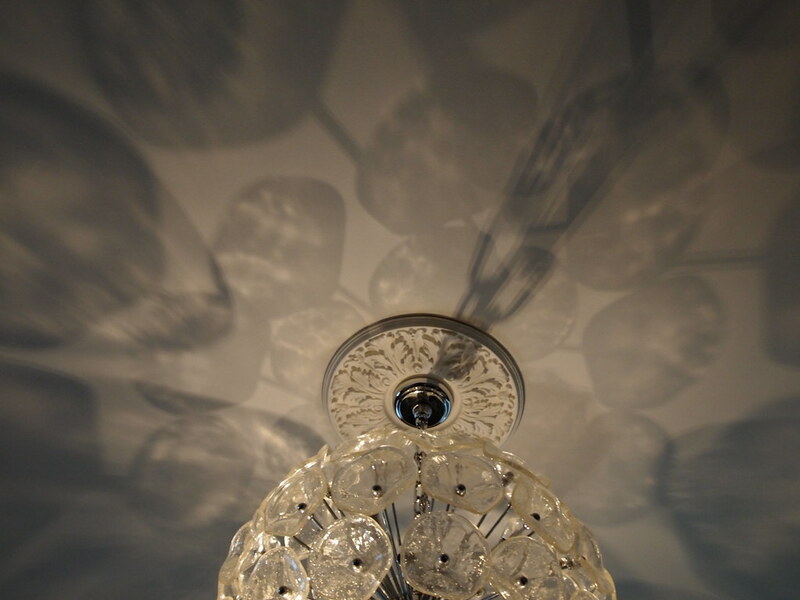 Eventually, we were able to install the new chandelier. We washed each glass flower. We spent two hours, together, screwing each one in. Ridiculous? Yes. But oh, look at the result! I imagine many of you are thinking, Wow. I would never put that in my house. But to me, it’s so different. It’s like this huge glowing glass flower ball welcoming you to our home. And I like things that are different. I like that not every house has a huge glowing glass flower ball welcoming people into their home. This entry was written by kara, posted on March 29, 2012 at 1:52 pm, filed under Things I Love and tagged andy, chandelier, craigslist, shopping. Bookmark the permalink. Follow any comments here with the RSS feed for this post. Post a comment or leave a trackback: Trackback URL.